The 2016-17 Bing-Davis Memorial Gallery artists’ schedule concludes with a thesis series featuring the works of Upper Iowa University seniors Sarah Pisney, Kelsey Hinrichs, Jamie Vargason, Morgan LaRue, Elizabth Nation, Carly Harms and Isaiah Solheim. The Pisney and Hinrichs exhibits will be open to the public during regular gallery hours Monday, April 3 – Thursday, April 13. 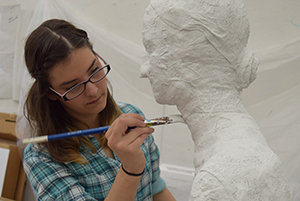 A reception for the two UIU art education majors is scheduled from 4 – 6 p.m. at Bing-Davis Gallery on Tuesday, April 11. The UIU Senior Thesis exhibits will continue with Vargason unveiling her artwork during a reception from 6 – 8 p.m. on Friday, April 21. The 2017 Senior Thesis art shows conclude with LaRue, Nation, Harms and Solheim showcasing their works April 19 – May 6. Additional details on these five senior exhibits will be announced at a later date.